His daughter's raincoat melted into her skin. He was playing around with his two young kids at their school’s sports day when disaster struck. A lightning bolt "five times hotter than the sun" hit the father and his five-year-old son and seven-year-old daughter,The Mirror reports. Geordie Jnr flung out of his father’s arms and landed up across the playground, Georgha’s raincoat had melted into her skin and 37-year-old Geordie Allen’s heart had stopped for 55 minutes. 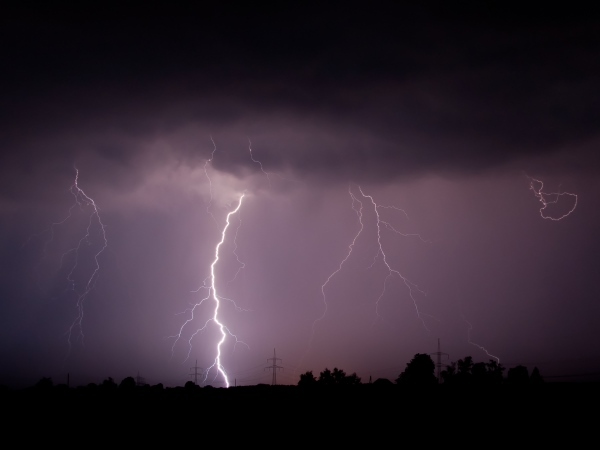 A deadly thunderstorm had turned the jolly sports day at Killowen Primary School, in Northern Ireland, into a horrific scene of panic. "It was a nightmare. It repeats with me every day. I just remember the screams,” Geordie’s wife, Sharon, says. Vice-principal of the school, Ashleigh Mulligan, and other teachers used the school’s defibrillator to deliver small electric shocks to the dad’s heart, in an attempt to revive him. Geordie Jnr and Georgha were rushed to Royal Belfast Hospital and treated at the specialist children’s unit. Their father was transported in a different ambulance to the Lagan Valley Hospital. He had suffered multiple organ failures, was burned severely and required four operations that day. He spent the next four weeks in a coma and five months after that in hospital in critical condition. "When I woke up, I had lost ten years of my life. I was really confused,” says the father-of-six. "It's still all blank. Now I don't even try to remember. I did try to at the start but I don't anymore. There's a reason why I forget it." The children were released from the hospital after a few days but Geordie was transferred to a specialist unit at Ulster Hospital. He was determined to make a full recovery, despite a bleak report from the doctor. Although the ordeal, which took place a year ago, has affected his life in a way that will never leave it the same again, Geordie has made a substantial recovery and wants to regain his independence. He told the BBC his ultimate goal is to get back on his feet and have a normal life again. "It's a miracle that he has survived,” says Sharon. “If we didn't have defibrillators that day I would have lost my husband and the kids would have lost their father.